Las Vegas Columnist Quits After Ban On Writing About Adelson Las Vegas Review-Journal columnist John L. Smith resigned after being told he could no longer write about two of the state's biggest players, including his paper's new owner, Sheldon Adelson. 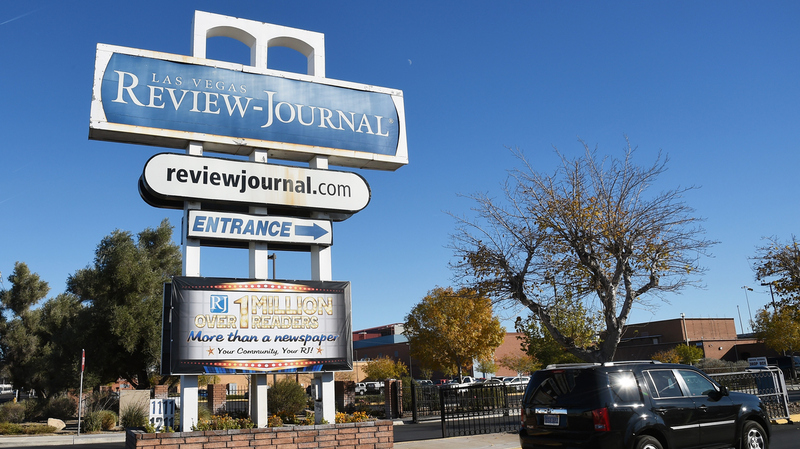 The Las Vegas Review-Journal, the largest news organization in Nevada, underwent a secretive ownership change last year. A prominent columnist for the Las Vegas Review-Journal, the largest news organization in Nevada, resigned after being told he could no longer write about two of the state's biggest players, including his newspaper's new owner, casino magnate Sheldon Adelson. "If I can't do my job, if I can't hold the heavyweights in the community to account, then I'm just treading water," the columnist, John L. Smith, told NPR in an interview. "It wasn't an easy decision to make, but there was no other decision to make — at least in my mind." Smith had written columns for the Review-Journal for nearly three decades, with a frequent focus on Adelson, one of the most powerful figures in Nevada gambling and national Republican politics. The billionaire sued Smith for libel over a passage in a 2005 book about power players of Las Vegas. Smith prevailed in court, but paying the fees helped bankrupt him. (NPR told that remarkable story, including a rabbi's offer of a secret $200,000 payoff from Adelson for Smith to admit libel, earlier this year.) Years later, the case has helped trigger the end of Smith's career at the Review-Journal, as his new bosses cited it as a conflict of interest. "I was sorry to see him resign and I wish him the very best," the paper's editor-in-chief, J. Keith Moyer, wrote in an email to NPR. "I decided that the strongest measure was best for the Review-Journal. John had thousands of other people, things and news events from which to choose to write about." Late last year, Adelson and his family bought the Review-Journal in a transaction that was initially intended to keep the new owners' identity secret from the public and the newsroom itself. The paper's reporters covered the mystery and subsequently identified the Adelsons despite the efforts of the paper's publisher to delay and soften the coverage. The paper's editor was among those who subsequently left. Promises of scrupulous disclosure of the Adelsons' interests were scaled back. If I can't do my job, if I can't hold the heavyweights in the community to account, then I'm just treading water. ... There was no other decision to make — at least in my mind. Smith says new management implemented a new policy earlier this year: He could not cover anything to do with Adelson. The then-acting editor, Glenn Cook, regretfully conveyed the decision from publisher Craig Moon. Smith says he took issue: "I said, 'He's the one who sued me, he lost, and I'm conflicted?' "
Smith says Cook told him: "You can't do it or you'll be fired." Soon after, the Adelson family announced its intent to build a football stadium to try to lure an NFL team to Las Vegas. That deal would rely on public tax dollars in a public-private partnership that Smith calls "a boondoggle ... that always seems to work for the private partners but not the public." Smith says although the stadium was a subject ripe for coverage, he didn't challenge his new restrictions and left it alone. At a journalism conference last weekend, however, Moyer, the new editor, publicly acknowledged that Smith was barred from writing about the Adelsons and their interests. Attendees tweeted out those remarks. One person present asked Moyer whether Smith could write about Steve Wynn, another billionaire casino magnate who had also sued the columnist in the 1990s. Smith was dismissed as a party from that lawsuit, which was unsuccessful. On Monday, Moyer told Smith he couldn't write about Wynn, either. Moyer arrived in Las Vegas after the decision was made by the new publisher, Moon, on coverage of Adelson. Moyer says he was simply affirming the policy that he fundamentally agreed with and extending it to Wynn. "I never suggested or believed John would use his column to settle a personal score, but if his writing on Adelson and Wynn created even a perception of score settling in the minds of readers, then it would have reflected on the credibility of the institution," Moyer told NPR. "Invoking 'conflict of interest' restrictions might not be common in Nevada, but they are elsewhere." Publicity around both the policy and Smith's decision to resign has triggered a new round of criticism aimed at the paper. Moyer argues that the criticism misses the point. "The real question reporters should be asking is: 'Did Sheldon Adelson order the ban?' But I suspect they're not asking that because they've already made up their minds that he did. Shame on them," Moyer says. He says he only took the job after Adelson promised him, in person, that neither he nor his family would ever interfere in newsroom matters. He says that promise has been kept. In addition, he says, the Adelsons have provided new resources to rebuild the newsroom that had been cut back significantly under previous owners. Other reporters and columnists for the paper will scrutinize Adelson, Wynn and other powerful players, Moyer says. Smith is 56 and says his financial circumstances mean he cannot yet afford to retire. He says he hopes to find a new home to report and write. "In many areas we will be as tough or tougher than we ever were," Smith says, speaking as though he were still part of the Review-Journal's staff. "The question is whether we'll be able to carry on in some of the most important areas. "I believe they show, day after day, that management is not mature enough or professional enough to let the reporters do their job, to let the columnists have their say, and put it in the public eye," Smith says. This week, a team of Review-Journal reporters is in Oregon to receive a prominent prize in media ethics for coverage of the paper's secretive sale last year and for uncovering the Adelsons as the new owners. Smith is among them. A previous version of this story incorrectly gave John L. Smith's age as 66. He is 56.